Elastic, safety flooring ideal for children playground floorings, applied at site in various thickness from 30mm up to 120mm. Consists of a prefabricated special safety pad for playground flooring RAPIDFOAM 868, followed by a layer of PU PRIMER 870 with a polyester net and on top a mixture in 15mm thickness of EPDM 856 (in granulometry of 1-3mm) with PU BINDER 1118 (upper layer). It can create many designs and patterns in a variety of EPDM colors. It is applied in thickness of 30mm up to 120mm, even on compacted, clean, dry gravel and on cement or asphalt surfaces. 1. 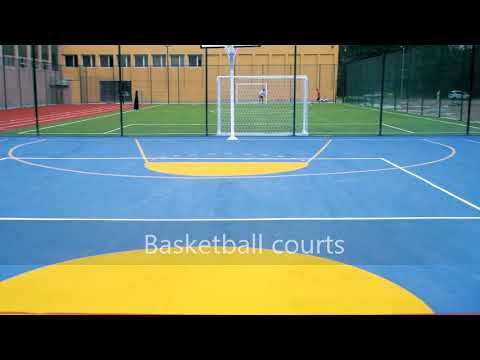 RAPIDFOAM 868 - Prefabricated special safety pad for playground floorings. 2. PU PRIMER 870 - Special, polyurethane primer with the parallel use of a polyester net. 3. SAFEPOL MULTICOLOR - Mixture of PU BINDER 1118 and EPDM 856 in granulometry of 1-3mm. Applied by flat metal trowel after spreading and leveling with rake and straightedge. Rolling with cylinder follows for compacting.